Michelle Baumstark, left, president of the Missouri School Public Relations Association, presents four awards to Cape Public Schools PR coordinator Steve Robertson, center, and Superintendent Dr. Jim Welker, during ceremonies Sunday at the MOSPRA state convention at Lake of the Ozarks. A new informational video produced by Cape Public Schools received the "Award of Excellence" from the Missouri School Public Relations Association--the highest award of the association-- at its state convention at Lake of the Ozarks, March 21. The six-minute video was filmed by students in the video production class at the Cape Career and Technology Center. It was edited by Randy McWilson and produced by the district's public relations coordinator, Steve Robertson. 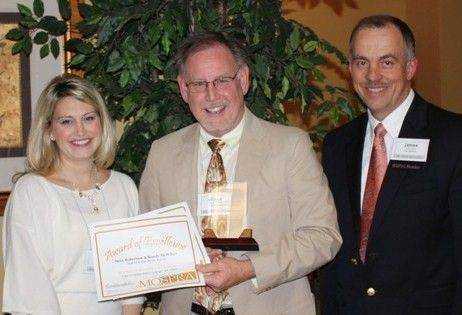 The association also named Mr. Robertson "Rookie of the Year"--an annual award given to a public relations person who has been on the job less than eighteen months. The district's newsletter and website and were also recognized with the "Award of Merit". Kris Oliveira is the website coordinator. YEAH! Cape public schools..a great place to be!there are a lot of good stories to be told about dedicated teachers who make everyday count for the kids! congratulations!! !on the win! my kids are products of cape public school..and this school district gave them what they needed to become the productive individuals that they are! good work! Looks like Randy McWilson should of been the one to receive the recongnition and not Mr. Robertson.